St. Louis here we come. Okay, it’s not the most, ahem, glamorous destination, but I’m a firm believer that life is all about the journey especially when the journey involves food. A certain chaos erupts in the hours leading up to our departures and no amount of pre-planning can change that. I’ve tried, for Greg’s sake. “Why do we always have to leave this place like we’ve been shot from a cannon?” he asks as he scurries from room to room gathering water bottles and misplaced phone chargers. I’ve learned to act as though it’s a rhetorical question, because those are the kind of questions best left unanswered when you are about to spend a lot of time in the car with the person doing the asking. I don’t actually mind the chaos though I don’t mention that either. Greg does the driving–the real work of the road trip–and for that I am oh so grateful. Once safely nestled in the car, my job is to navigate and feed and entertain the driver. It’s a nice gig, right? The inevitable flurry of activity around our departure provides a stark contrast to relaxing in the car for hours on end, making me feel as if I’ve earned the right to sit on my bum. My favorite way to perpetuate the chaos is to experiment in the kitchen the day before we’re set to leave. (Yes, Greg finds that maddening until he’s somewhere in the middle of I-80 noshing on a homemade goodie.) When I should be tracking down that darn purse that matches my sparkly black go-out shoes, the one I haven’t seen since the last wedding we went to a year ago, I’m instead pouring over notes for a new granola bar. I’m suddenly over my go-to granola bars, the ones I can make without a recipe or an oven, the ones that Greg loves even though we both agree they’re a bit too sweet at times. I wanted a slightly savory bar that would do double duty as both a filling snack and a breakfast bar. These tasty treats fit the bill. They pack a punch with enough protein to keep you going from breakfast until lunch without a single hunger pang. There’s a lot more I wanted to say about our upcoming adventure and all the yummy treats I prepared for the road and my lovable driver, but my Bob-Á-Go-Go Bars are ready for wrapping and packing. And I still haven’t found that purse. Line a 9×9″ square cake pan with parchment paper. Combine the puffed cereal, peanuts, and dried fruit in a food processor and pulse until the mixture is coarsely chopped. Add the wheat germ, oatmeal, and sunflower seeds. Pulse once or twice to combine. Add remaining ingredients and pulse until thoroughly mixed. It will resemble a thick, coarse paste. Using a lightly oiled large spatula or your hands, evenly compress the mixture in the prepared pan. Bake 30-35 minutes, until golden brown and pulling away from the parchment paper at the edges. Allow to cool in the pan for 30 minutes. Cut the slab into a 6×3 grid while still warm. When bars are completely cool store in an airtight container and refrigerate. 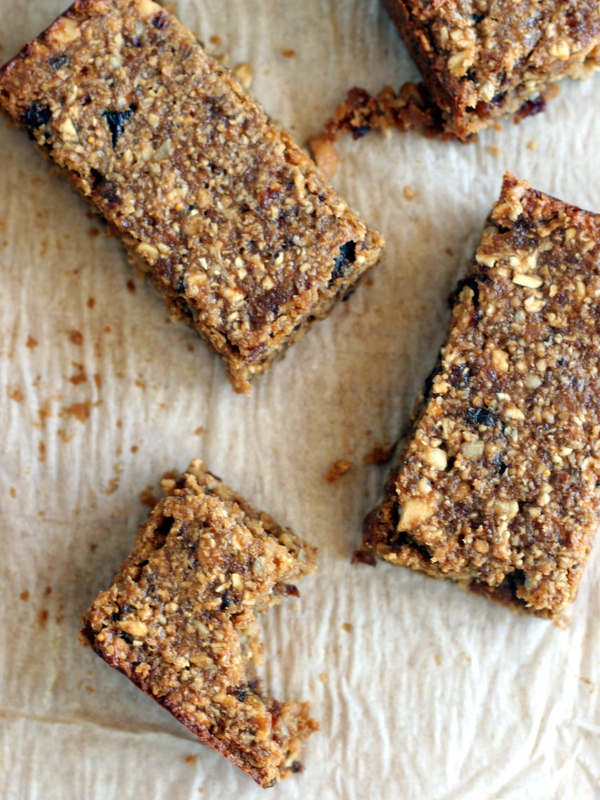 My second favorite granola bars: Chewy Blueberry Almond Granola Bars. Do you think we can negotiate a new trade so I can get my hands on one of those? Perhaps I could treat you to lunch so we could catch up? No need to trade Beth–they can be your birthday present. Yes, yes, let’s get a lunch date on the calendar.